Home /News, Uncategorized/Transforming Lives Through Community Engagement! The Midlands State University (MSU), through the Department of Animal and Wildlife Sciences has made significant strides in operationalising the ZimAsset Economic Blue print as evidenced by its various community engagement projects that seek to empower communities by utilising locally available resources. To this end, the Department of Animal and Wildlife Sciences has identified several projects such as guinea fowl production that require low initial capital investments and basic maintenance levels. Upon realising that the majority of small holder communities that had been targeted for community engagement projects by the University, did not have sufficient financial resources needed to start up viable income generating activities, guinea fowl production emerged as a feasible alternative aimed at addressing issues of food security and nutrition as well as Poverty Eradication as outlined in the ZimAsset Blueprint. To kick start the project, the Department of Animal and Wildlife Sciences bought guinea fowl eggs from communal farmers with surplus, in Gokwe North. 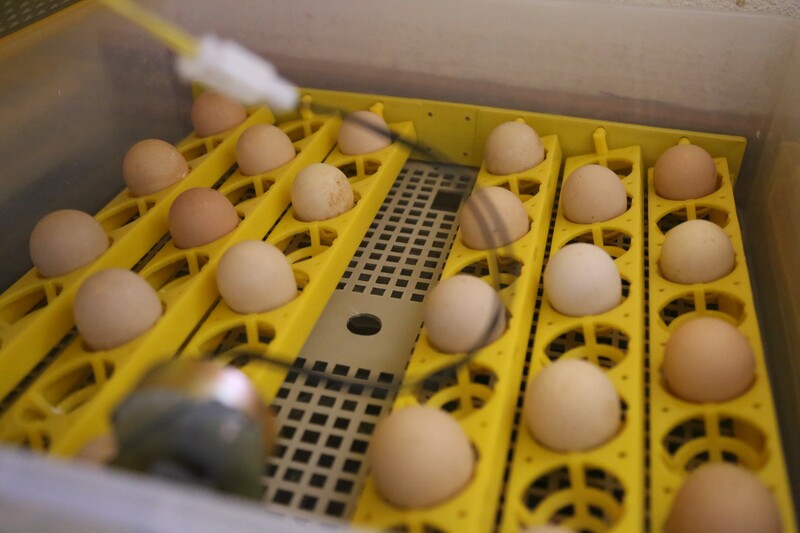 Some eggs were placed in artificial incubators at Midlands State University’s laboratories whilst others were assigned to indigenous hens for natural incubation at MSU’s Gwomututu Community Engagement Centre in Mberengwa. The initial phase of the project is expected to produce more than six hundred hatchlings. The hatchlings will be distributed among small holder farmers who are actively involved in the rearing of indigenous chickens and have a keen interest in community income generating projects. As part of capacity building efforts among community members, staff in the Department of Animal and Wildlife Sciences will conduct workshops on rearing guinea fowls and indigenous chickens with course materials covering aspects such as planning before starting a flock, housing, nutrition, brooding as well as the control of internal and external parasites. The Department expects the engagement to be mutually beneficial particularly given that this is a potentially rich area of research, with researchers looking at appropriate feeds, disease and pest management practices in order to develop better practices and extended them to the small holder sector. Commenting on the guinea fowl project, an official in the Faculty of Natural Resources Management and Agriculture, highlighted that, the ‘Guinea fowl project has great potential in the small holder sector which from time to time has to grapple with food insecurity and general poverty’. Guinea fowls popularly known as guineas have a high productivity and research has proved that a guinea lays between 100 and 200 eggs per season. To this end, this programme is envisaged to boost guinea fowl production so as to provide nutritious meat, eggs and generate income for vulnerable communities. Guineas’ meat is special in that it is lean, tender and rich in essential amino acids. Guineas are increasingly popular among small holder farmers due to their adaptability to difficult conditions. This species of birds are resilient to pests and diseases, and are not easy prey to other bird predators. Literature also suggests that they are used by farmers, to some extent, as an effective means of pest control since they feed mainly on insects, and can consume large amounts of insects which could affect garden vegetables or flowers. Their nutrient-rich manure can be composted or applied as an instant organic fertiliser in the garden. Guinea fowl flocks have also been known to attack snakes. The University hopes that once the project is fully fledged, communities will be able to share the progeny and by so doing, communities will benefit on a broader scale. Given the benefits associated with domesticating guineas, small holder farmers are encouraged to share their experiences and also, to venture into this project.